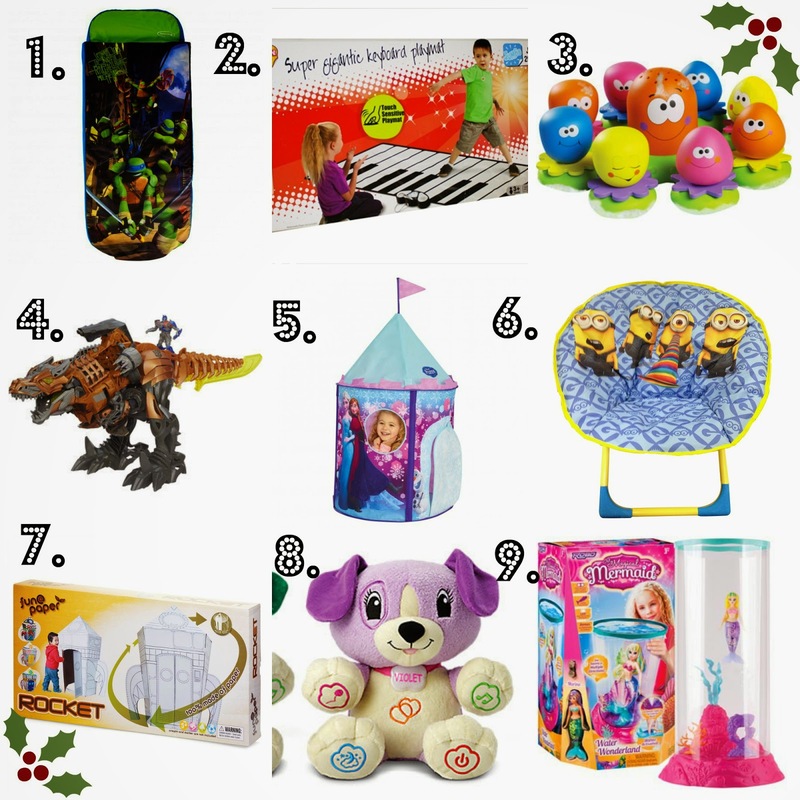 Christmas Gift Guide 2014 - Children's toys! 1. Teenage Mutant Ninja Turtles Junior ReadyBed - RRP £29.99 Available from Amazon and Argos. "Snuggle up, settle down, shut your eyes – a slumberfull night awaits. Perfect for a home stay or a nighttime adventure away, the Turtles Junior ReadyBed is the all-in-one sleeping bag and bed where superhero sleep comes easy. Let Donatello, Michelangelo, Leonardo, and Rafael take him from eyes wide open to the land of nod in moments. Simply pop it open, pump it up and have him tucked in tight as a hero in a half shell in seconds, cosied up on a super-soft mattress and plush built-in pillow." 2. Zippy Mat Gigantic Keyboard Playmat - RRP £19.75 Available from Amazon. "Giant piano playmat with 24 touch sensitive keys, Select which of the 8 instruments you want the keys to sound like, then run along the keys to play delightful tunes. Te function buttons along the top allow you to record and play back your musical creations. Great for kids and parties. 3. Tomy Bathtime Octopals - RRP £9.99 Available from Toys R us (Babies R us). "Floating bath island toy featuring a mummy octopus pouring cup and 8 little baby water squirters that can stick to bath sides or tiles. Your toddler will have great fun in the bath with these brightly coloured fun Octopals! Squirters have a different number that corresponds to a number on the base for number matching fun." 4. Transformers 4 Stomp and Chomp Grimlock - RRP £84.99 Available from many places including Tesco, Smyths, Toys R us and Argos. "At almost 40cm tall, this Transformers 4 Stomp and Chomp Grimlock features incredible attention to detail plus lights and sounds. This mighty figure is ready to take on any enemy and can convert in just 1 step into a chomping dinosaur with light up eyes." 5. GetGo Disney Frozen Play Tent - RRP 24.99 Available from Argos and Amazon. "Dream of being whisked away to a fairytale Castle? Discover an enchanted kingdom on your doorstep with our Disney Frozen Castle Play Tent. Whether she’s getting ready to be crowned queen indoors or planning a Frozen adventure in the garden, with her princess friends Elsa and Ana by her side this Castle Play tent is the perfect place for fairytale adventures." 6. Despicable Me Moon Chair - RRP £24.99 Available from Argos and Smyths.
" This is a must have for all Despicable Me fans who want to get their hands on all things Minion! This fun folding moon chair from HGL is the perfect way to bring a touch of Minions to the home and is the perfect size for young Minion fans to sit comfortably while playing or watching TV. " 7. Colour Your Own Cardboard Rocket Playset - RRP £20.00 Available from Hawkins Bazaar. "NASA spends so much time and money on its shuttles, you'd have thought they could have at least put a little bit of colourful flair into their designs. Now you have the chance to succeed where our most talented rocket scientists have failed with this rocket playhouse that comes ready to be coloured. Once the cardboard pieces have been folded and slotted together, the rocket stands over a metre tall and can be decorated with any materials that little astronauts desire." 8. My Pal Violet/ Scout - RRP £17.99 Available from Argos, Smyths, Amazon, Toys R us, Very and more.
" My Pal Scout introduces a variety of early learning concepts from numbers to routines and music. As a loyal learning buddy, Scout prompts kids to interact with him socially and encourages them to talk and sing along to build early language skills." 9. My Magical Mermaid Play Set - RRP £19.99 Available from Hawkins Bazaar.
" What's a magical mermaid without her own underwater kingdom to explore? Fill this large cylindrical tank with water and then drop in the included mermaid figure and she'll start to explore her new underwater wonderland. Flip the switch to activate the blue LED light, illuminating the water to make it look like an enchanted lagoon. The water-activated My Magical Mermaid figure swishes her tail to swim, darting between the plastic rocks and coral at the bottom of her tank. Place the magic ring around her waist and she'll bob up and down, or slip it over her head like a crown and she'll swim horizontally on her back." There are so many fantastic gift ideas out there this year that it was really hard to choose just a few to share! What is at the top of your children's wishlist to santa this year? I love the cardboard rocket I included it one of my own gift guides too! Well I don't have any children, but if I did Stomp and Chomp Grimlock would be first on the list. It looks awesome! I love the rocket too. Such a fun idea!